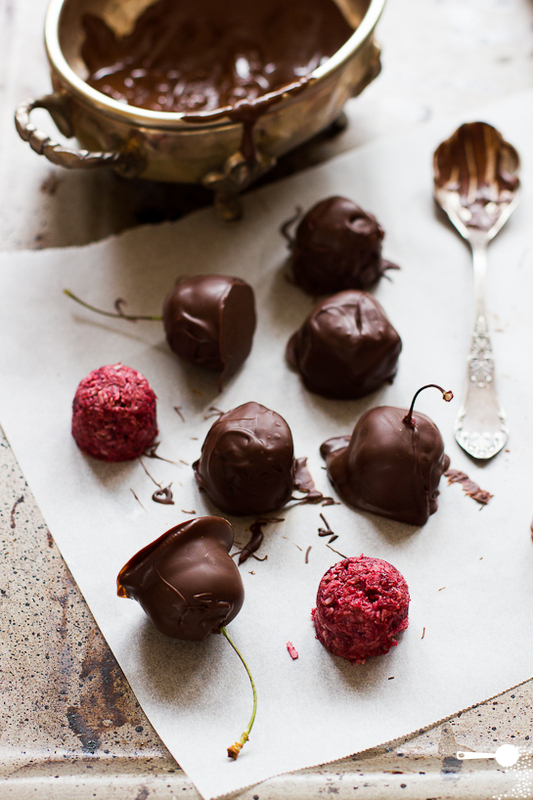 These Homemade Cherry Ripe Bites taste exactly like the bars you get from the shops! Made with only 5 ingredients they contain No Added Sugar – only fresh fruit! What’s your favourite candy bar? I would have a hard time choosing between a creamy Bounty and the Aussie Cherry Ripe. See the pattern? Yep, both contain coconut! 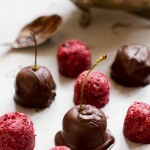 Since I’ve already made homemade Bounty balls, it was time to reinvent the Cherry Ripe. You see the original Cherry Ripe is made with glace cherries, which have extra sugar (and preservative) added. Even dried tart cherries have added sugar, so I passed on that idea. Instead I roasted some fresh cherries myself. But don’t worry, my fresh cherry version, with no added sugar, is still sweet enough. And because I’ve developed this recipe for the Berry Nice to Meet You Blog Hop, I’ve added some homemade dry-roasted strawberry powder for extra flavour and sweetness. As this step takes a couple of hours, you could use store-bought strawberry powder, or the same amount of dried goji berries instead. If you’d prefer to go dairy-free or vegan with these, simply use dairy-free chocolate chips or make your own vegan chocolate. And feel free to play with shapes. I used a rubber ice cube tray from this range – it needs to be rubber, because the filling, although set, is a little soft so it won’t come out as easily out of a regular hard plastic mould. Or, you could just as easily use a small rectangular container to make your treats into bars. 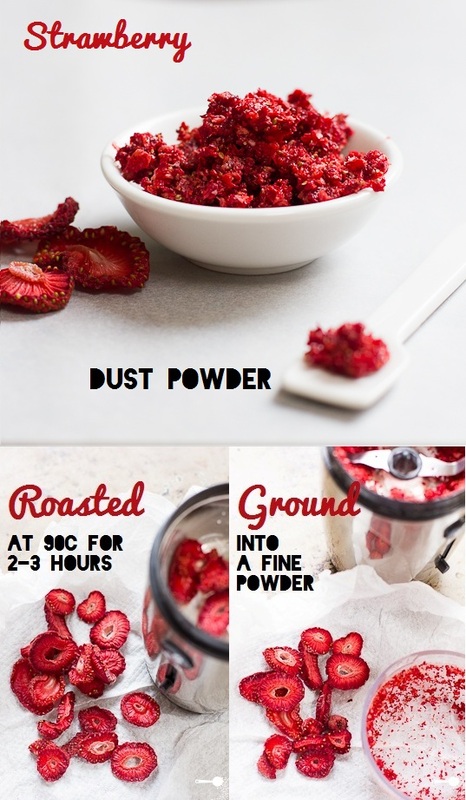 While homemade dry-roasted strawberry dust is used in this recipe, you can just as well substitute it store-bought powder or with equal amount of dried goji berries. You will need latex gloves to pit the cherries and a silicone ice cube tray to make these cherry ripe bites. Otherwise shape into a block and cut into bars or bites. Preheat oven to 110C (90C fan-forced, 225F, gas mark 1/4). Wash strawberries are remove stems. Slice strawberries into 4mm thick slices and spread on a paper-lined baking tray. Roast for 2-3 hours, until strawberries have dried out. When dry, grind to a powder in a coffee grinder or blender. Preheat oven to 160C (140C fan-forced, 325F, gas mark 3). Spread cherries, cut side up, on a paper-lined baking tray and roast for 20 minutes. Place roasted cherries and strawberry powder in a 2 cup capacity jug. Blend using your stick blender until smooth. Add dessicated coconut and melted coconut oil. Mix to combine. Fill a silicone ice cube tray with the cherry berry mixture and place in the fridge for 1 hour to set. Once set, remove from the mould. 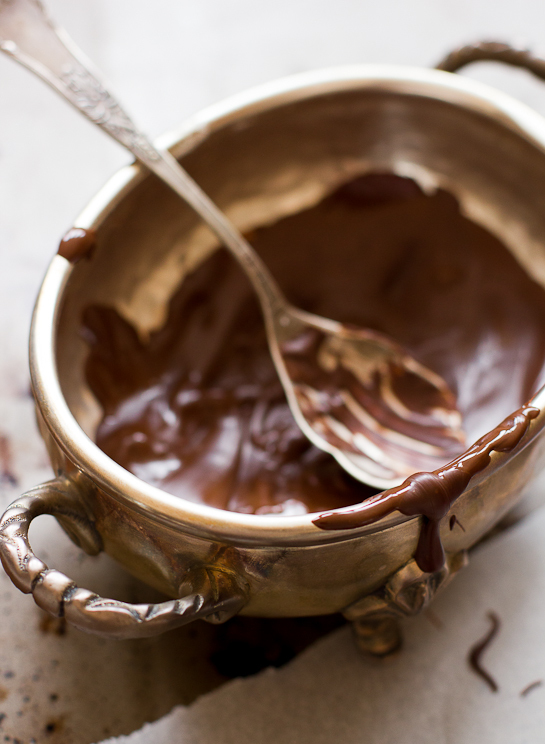 Melt dark chocolate in a small bowl (in the microwave is fine, heating for 20 seconds at a time then mixing). 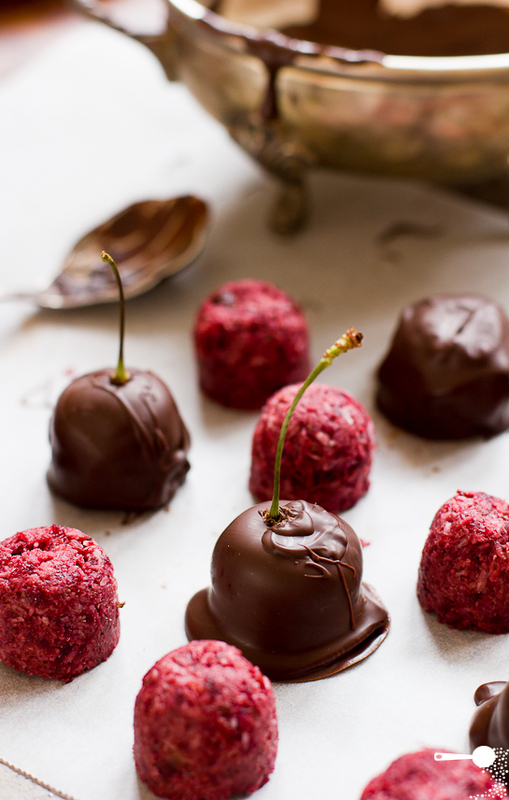 Dip cherry ripe bites in melted dark chocolate. Set aside on baking paper for the chocolate to set. Keep Cherry Ripe Bites in an airtight container in a cool, dry place or in the fridge for upto 1 week. 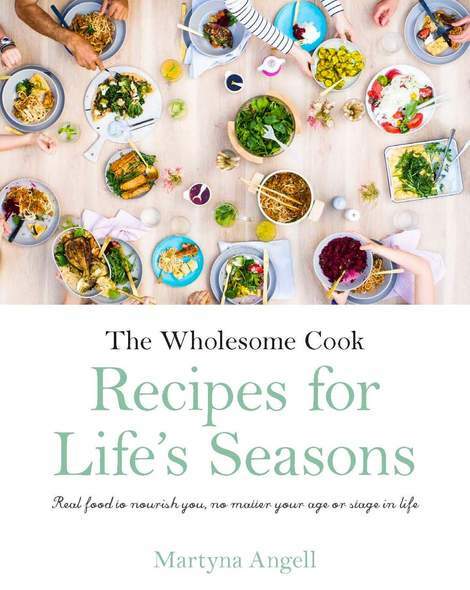 $2 Cookbooks, Food Styling Tips, Coconut Oil + 7 Coconut Oil Recipes, Sustainable Tuna + More! OH EM GEE!!! I just fell off my chair trying to reach into the screen and eat that cherry ripe! If this is not the cutest presentation of a cherry ripe then I don’t know what is! 5 ingredients too… AWESOME! Off to check out your Bounty recipe now. Lordy, these look just amazing! And you say you have a Bounty recipe too?! Must find that one! Wow, these look delightful. What beautiful presentation and a great recipe. These I must try. Every time I open a Wholesome Cook email I am amazed at your creativity and ability to take the ordinary and turn it into the extraordinary. Cherry ripe bars are my favourite and now I know how to make them more wholesome. Thank you Wholesome Cook. I’m going to try the vegan version of these. Thanks for the inspiration and the link to the vegan chocolate recipe. It’s been a while since I was excited about a recipe makeover like this. Love. Amazing, simply amazing. I have been thinking about how to make cherry ripe bars for ages and never would have come up with roasting cherries or making strawberry dust (far out it sounds divine!!!). Will have to try this! WOW! This is amazing! Love that you actually roast the cherries and added an additional berry kick. Cherry Ripes are my partners favourite chocolate bar. I am totally making these for him for his birthday!! LOVE the strawberry dust too. Wow! I am amazed, that looks so good. Its like the ones you can buy in gourmet chocolate shop. I have a hard time choosing between Bounty bars and other candy! And although I’ve never tasted Cherry Ripe, I can tell just by your rendition of it, that I’d love them! These are totally awesome! I love your strawberry powder too. Oh YUM. I have got to make me some of these. I see a new addition to my Christmas cooking repertoire! A new treat for Santa? Or a pretty alternative to mini fruitcakes to give away as gifts 🙂 Good thinking Sugary Flower! Martyna, oh my goodness these little bites are so beautiful! I’m really really impressed by them right now. It’s like from a fancy chocolate shop! Absolutely gorgeous styling Martyna and I love the little cherry stems sticking out from the newly enrobed cherry ripe bites. Delicious! Absolutely love this idea M !!!! They look fantastic, especially love the cherry stems sticking out. Lush chocolate work. Thanks Sara 🙂 Who knew microwave could be my best friend for tempering chocolate. It seems to work every time! These look incredible, Martyna. What a fantastic recipe! Wonderful recipe, Martyna! I love the whole vibe of this dish and I must give these a go, they would make great gifts at Christmas. I used to love the chocolate covered cherries at Christmas but haven’t eaten them the past few years because they aren’t as tempting now that I know what is in them! I’m going to have to make these instead! thanks for the recipe! The question I am asking myself now is: will I have time to get to the supermarket after work so I can make these tonight! Can you send me some over? I don’t know how CHerry Ripe bars taste, but those you’ve made look like … well … eh … like I would love to try them right away! These look absolutely delicious! 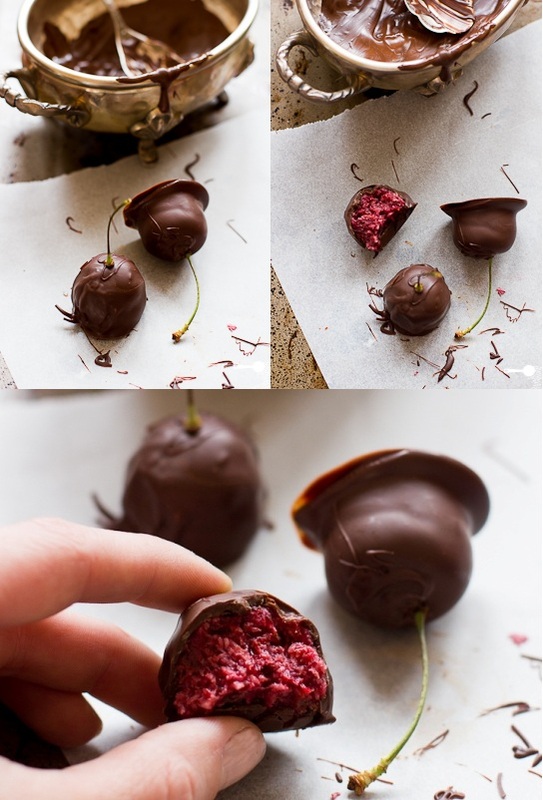 I am definitely bookmarking this to try as soon as cherries come in season! Can’t wait – what a great idea! I don’t own a microwave; I’m quite anti-microwave cooking in general so I still temper the old-fashioned way. Ah, those look amazing. I also thought I commented on this before, but apparently I forgot to. Just a fantastic idea, and good for you ! cherry ripe bars are my favourite thing of all !!!! Yum! These would be perfect as an after dinner-party chocolate. Going to try them next time I’m entertaining. I wish I could get a bite of these yummy looking strawberry and chocolate bites. your homemade cherry ripe bites looks fab like all bought from any store. This recipe you have shared is tooo good!! This is unbelievable…..these can’t be home made. These look like GREAT!!! really delicious and they look amazing. looks so delicious. by the way, where did you get your ice cube tray with that shape from? What a fantastic recipe. I made them for my sweetie yesterday for a Valentine’s Day treat. I was lucky enough to find freeze dried strawberries at the store which worked perfectly for the powder and saved me a ton of time. And, I used frozen cherries…just roasted them a little longer. Love that they taste delicious with so few ingredients. Wow!!! These look amazing!! Am definitely trying this!!! These look so delicious, could you use frozen cherries when fresh are out of season? Yes you can, just strain them once defrosted.